I spent last week up on Orcas Island at “spinning camp” with Judith MacKenzie – my 4th time at this event (I missed 2009). This year’s theme was “Bringing Color into Your Spinning”. They were set up to do a lot of dyeing outdoors (always a bit iffy in February in NW Washington). Then it snowed. And got really cold. But our organizers managed to score an indoor space in an adjacent cabin to the meeting room, swathed it in tarps to protect the furnishings, and we pressed on! The first day Judith entertained us with stories of her trip to Peru in November 2010. She was one of the speakers at Tinkuy de Tejedores (A Gathering of Weavers) near Cusco. 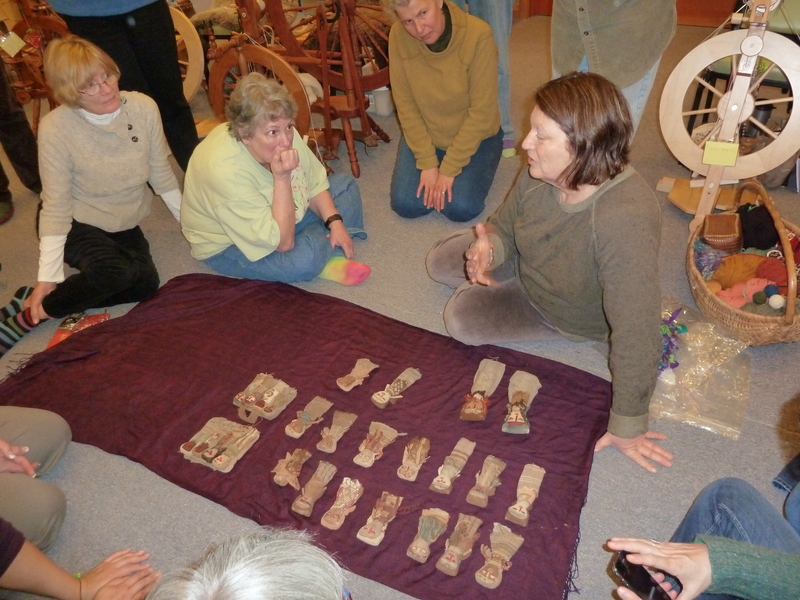 She brought back some beautiful textiles, all nature dyed handspun and woven on primitive backstrap looms. 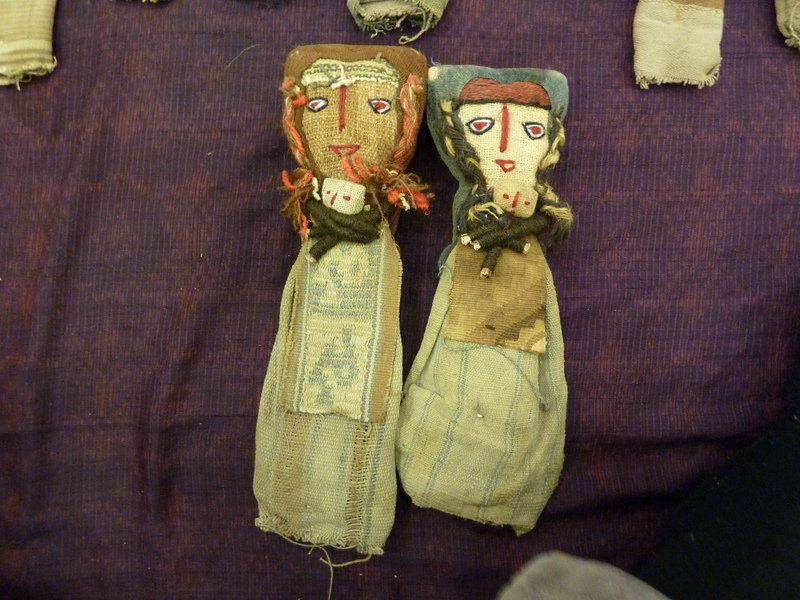 She also shared a portion of her collection of Peruvian “burial dolls” – many of them very, very old. 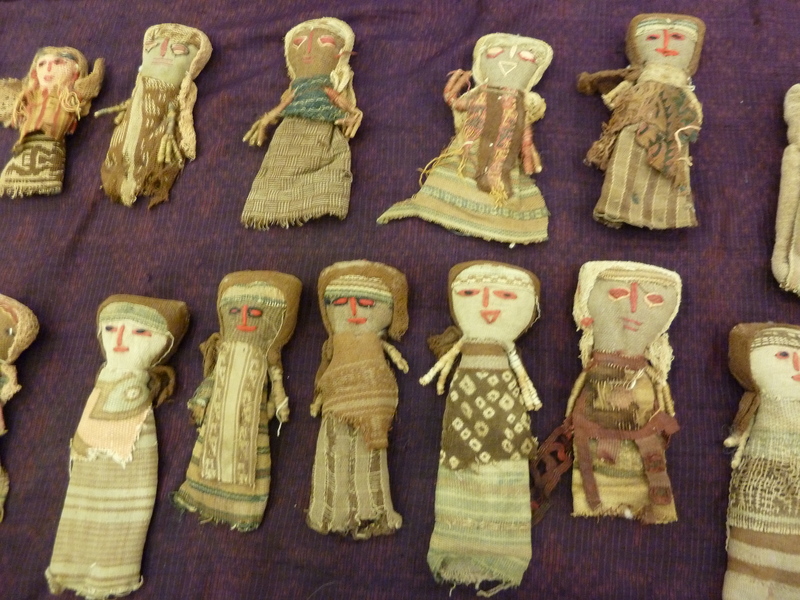 They are not really dolls, but religious or ceremonial objects. The clothes they wear are made from fragments of cloth that were originally on mummies, so in some cases the textile fragments could be thousands of years old. 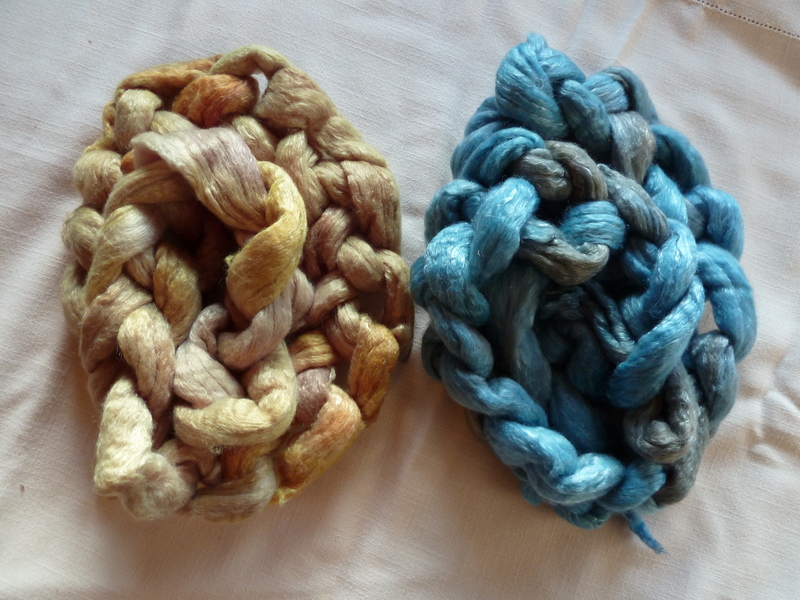 The first class project was to spin a boucle yarn using a rayon core and kid mohair locks that Judith had dyed. I skipped this one, as I have tried it before, am really bad at it, and know I won’t be pursuing this one any time soon. The basic roving was quite muted, cream through shades of greyish purple, but I introduced short sections from another roving from time to time: dark royal blue through purple, and a brighter turquoise color. 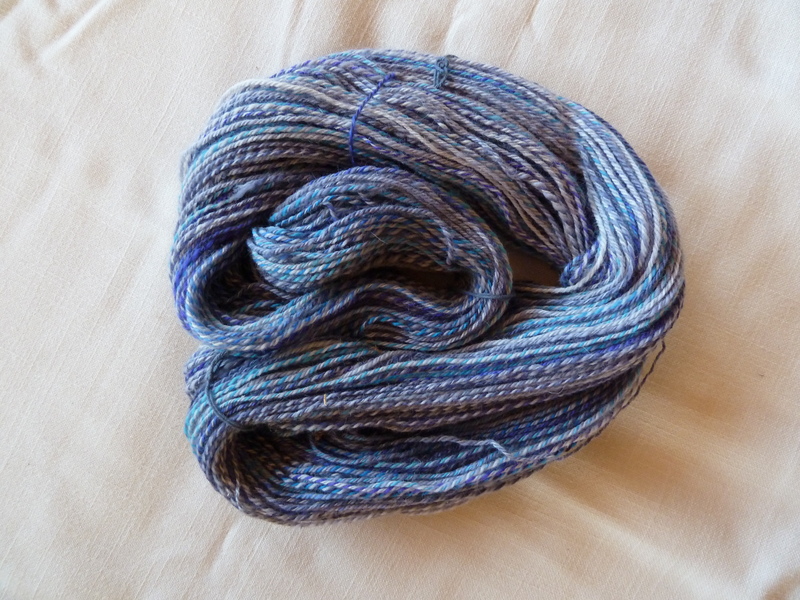 I spun all the singles, divided it into thirds by weight, and made a 3-ply yarn where all the colors just come and go randomly. I am pleased with the result and will probably use this idea again. 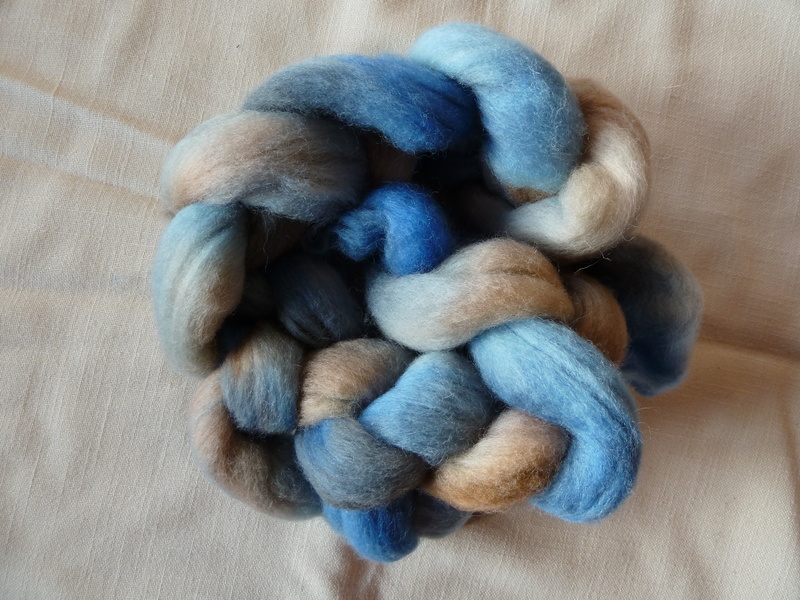 I also spun up some Polwarth roving that I bought from Maxine of Island Fibers on Lopez Island, at the event. 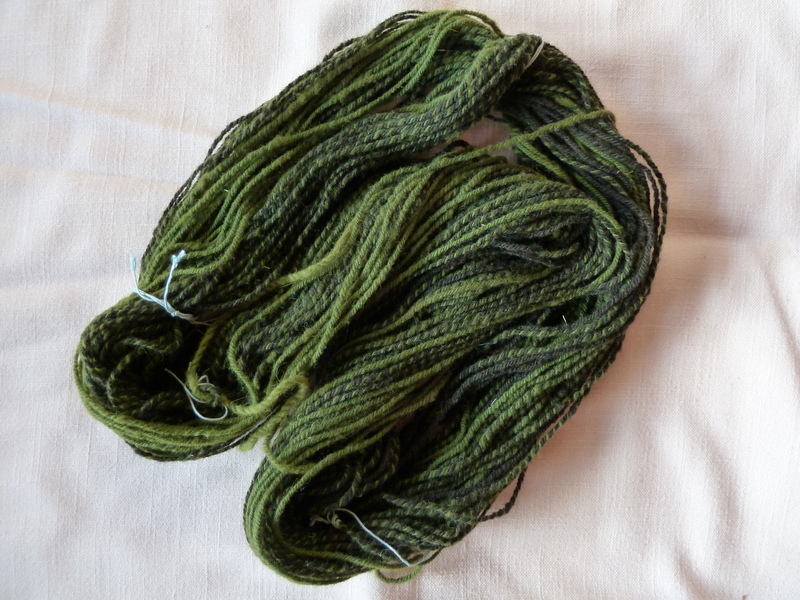 I made about 150 yds of 3-ply and it is wonderful, springy and soft yarn. I will definitely be spinning more of this fiber. 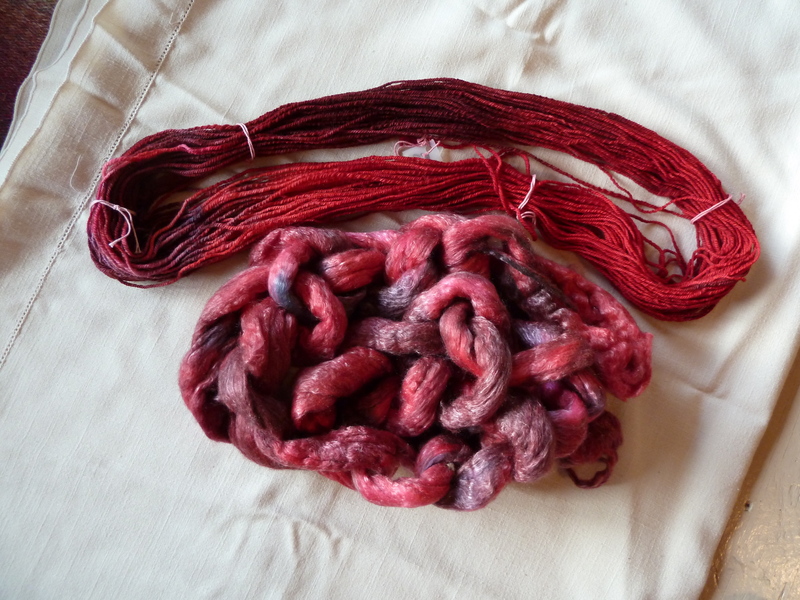 I dyed it in one of the roasters along with some merino/tencel roving I also bought from Maxine. Can you say RED? The one on the left was supposed to have more purple tones in it, but as it turns out this was superwash merino and it takes up dye very quickly. It all just sort of blended together. But I can put it back in a dye bath at home and try to modify it some, and I will. It looks like you had so much fun! Your dyeing is beautiful; I especially like the lettuce and its technique. Thank you so much for sharing…. and the dolls! It’s amazing that the dresses on them have so much woven patterning. Are you going to come to Norman Kennedy’s workshop at Suzanne’s, by any chance? He’s doing cochineal dyeing. Hi Sheila – probably not on the Norman Kennedy workshop, although I am sure it will be fabulous! I’ve been to 2 workshops in as many months and it’s not in the budget to do more at this point. But at least I have a lot of new ideas to play around with.